Home / Eye Care / How Do Your Eyes See? Your eyes perform some of the most complex processes in your body, resulting in your ability to see. Understanding how your eyes work is important, as it helps you make better choices regarding your visual health. 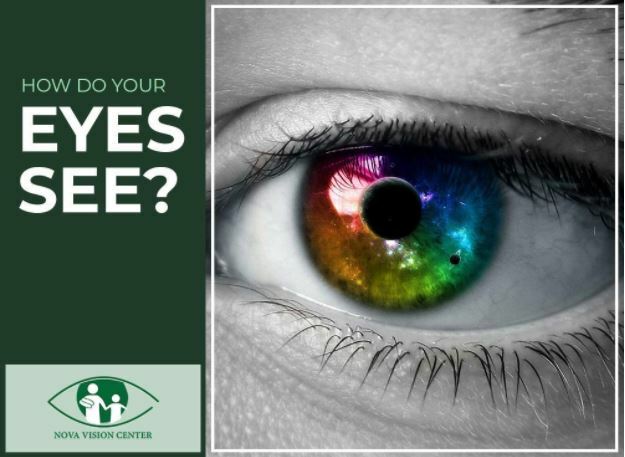 Read on as your eye doctor from NOVA Vision Center explains how your eyes work. Light first passes through your cornea, the transparent structure covering your eyes. It then enters your pupil, a small opening whose size is regulated by the iris, the colored region of your eyes. Behind the iris lies the lens, which is responsible for focusing light rays toward the retina. It also has shape-changing abilities. It curves when you’re looking at nearby objects and flattens when you’re looking at a distant object. The retina is located at the back of your eye. Your optometrist explains that it contains light-sensitive cells called photoreceptors. The photoreceptors found in the center are known as cones. They help you see things ahead of you, appreciate details and distinguish different colors. The rods are mostly located at the periphery of your retina and help you see clearly in low-light places. These two kinds of photoreceptors convert light into nerve impulses, which the optic nerve delivers to your brain for image interpretation. During an eye exam, your eye doctor will use advanced equipment to assess your ocular structures for any problems. This allows us to detect any irregularities that could lead to vision errors. For example, if we find that your cornea is too curved, this may be a sign of myopia, commonly known as nearsightedness. This refractive error causes faulty far-range visual acuity while your close-range vision remains sharp. We may prescribe eyeglasses or contact lenses to improve your vision. For more information about your eyes, call us at (703) 291-0080 or complete our form. We serve Alexandria and Arlington, VA, and nearby areas.